Aerial Imaging Market size was estimated at over USD 1.7 billion in 2017, growing at over 12% CAGR from 2018 to 2024. Growing popularity of Unmanned Aerial Vehicles (UAVs) for aerial photography applications and increasing incidents of natural disasters are expected to drive the aerial imaging market growth between 2018 and 2024. The growing adoption of aerial imaging systems in military & defense applications is expected to majorly contribute to the growth during the forecast period. For mission simulation functions in defense applications, the data gathered through aerial imaging platforms is used to create flight simulation environments, wherein aircraft pilots can get accustomed to the actual terrain conditions on the field. The pilots can effectively compose flight routes using the aerial imagery data to maximize the outcome of their combat operations. Aerial photography is critically useful in assessing the impact of large-scale natural disasters. It significantly reduces the access time as damage assessment can be immediately expedited by studying aerial images of the area that might be difficult to access on the ground. The images also serve as an excellent tool for evacuation planning by identifying potential hazardous sites, such as nuclear power plants and factories, and assist the relief personnel in determining evacuation zones and best routes. The UAV/drone segment is expected to hold the majority market share of around 78% by 2024 due to the extensive adoption of the platform for aerial photography applications by the government and defense sectors. As drones offer a convenient imaging alternative for capturing aerial photographs in urban areas, government agencies are increasingly adopting these platforms for law enforcement and crime investigation purposes. The platform is also expected to gain significant acceptance for smart city management applications in the government sector over the forecast timeline. Contrarily, as helicopter-mounted camera platforms are highly expensive compared to UAVs, their adoption for aerial imaging is projected to witness a steady decline between 2018 and 2024. 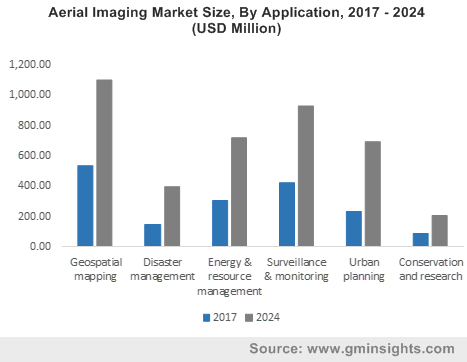 The oblique imaging segment is projected to exhibit an accelerated growth in the aerial imaging market over the forecast period and gain a share of over 43% by 2024. This excellent growth can be attributed to the benefits of oblique imagery in assessing building heights during the realistic texturing of 3D city models. The key advantage of using oblique imaging is the possibility to clearly view elements on the ground that are usually occluded in the vertical views by higher structures or vegetation. The disaster management segment is projected to exhibit a lucrative growth at a CAGR of over 16% between 2018 and 2024 due to the increasing adoption of aerial imaging platforms for assessing the magnitude of damage caused by natural disasters. As climate change has resulted in an increase in the number of natural disaster incidents around the world over the past four decades, the need for effective damage assessment measures has increased considerably. Drones are being increasingly employed after the occurrence of disasters, such as storms and wildfires, to address the repair and relief requirements in a timely manner. The agriculture market is projected to witness a high growth during the forecast period due to the technological advancements in drone platforms and sensor technologies for assisting precision agriculture functions through the mapping of different parameters such as vegetation health, soil health, and fertility levels. Some of the applications where aerial imaging helps precision agriculture operations include irrigation scheduling, scheduling of pesticide application, in-season analysis, and evaluation of the effectiveness of fertilizer applications. Asia Pacific aerial imaging market is projected to register the fastest growth between 2018 and 2024 at a CAGR of over 16% due to the increasing awareness reading the utility of aerial imaging among developing countries in the region. Due to the increased affordability of capturing aerial images resulting from the advent of low-cost drone platforms, the adoption of aerial photography platforms will increase rapidly in the region. Also, with the large-scale utilization of UAVs for aerial imaging purposes in countries including China and Japan and the increasing popularity of smart cities in emerging economies such as India, the aerial photography market is expected to register an accelerated growth in the region between 2018 and 2024. 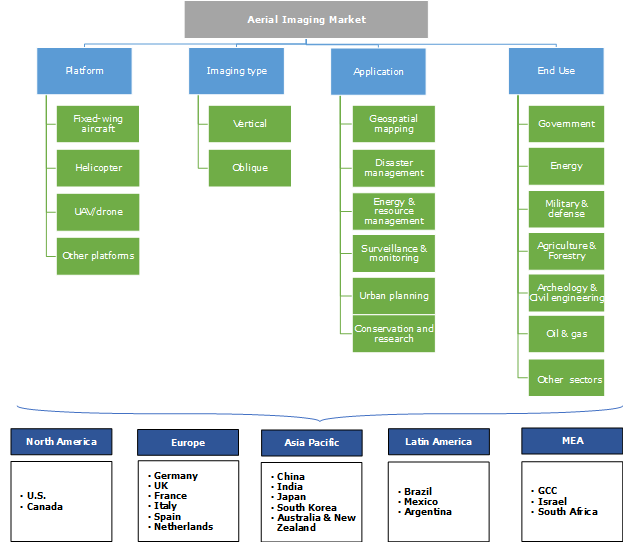 The companies operating in the aerial imaging market are emphasizing on incorporating advanced capabilities in their imaging platforms through modern analytics and image processing solutions. Such solutions are enabling customers to derive images/maps with a diverse range of parameters useful in applications such as agriculture, energy resource assessment & management, and environmental conservation and research. Some of the companies operating in the aerial imaging market are Cooper Aerial Surveys, Google, Eagle View Technologies, Kucera International, Nearmap, Digital Aerial Solutions, Airobotics, 3D Robotics, DroneDeploy, Fugro, GeoVantage, DJI, Getmapping, and PrecisionHawk. Traditional aerial photography techniques, such as camera systems mounted on kites, balloons, and parachutes, are experiencing a steep decline in their applications as they can prove unreliable in varying or harsh climatic conditions. The technological advancements in drone technology have offered a convenient and a highly reliable alternative to the prevailing platforms for obtaining highly accurate and clear aerial photographs. Also, with increasing investments in innovations, such as the incorporation of AI capabilities in UAVs, the utility of aerial images is likely to increase rapidly over the forecast timeline.